I used to love playing Will Wright's simulation games when I was younger. I spent hours on Sim Ant, Sim Life and Sim Earth, all of which offered a fascinating if somewhat limited simulation of the subject matter. They become more sophisticated over time, and now Will Wright is putting the finishing touches to Spore - a game that enables you to take a single celled organism, evolve it into a multicellular creature, build a tribe, a civilisation, and eventually colonise other planets. It all sounds like an overly-optimistic exercise, but I'm looking forward to how it turns out nonetheless. 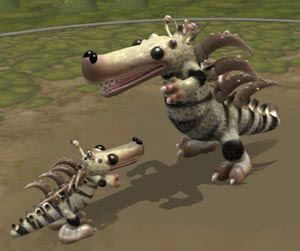 The first taste of the game was released a few days ago in the form of the Spore Creature Creator. As a zoologist I couldn't resist. You start off with a basic body and spine, and the ability to change its shape, add limbs, sense organs, weapons and other bits and pieces. After mere minutes you normally end up with a living, breathing digital creature that you can take for a walk around a small arena, activating a number of behaviours to show it off. It's a prelude to the main game, but it's no doubt a complete game in its own right. The power of the editor is remarkable, and the way the game interprets your creature and makes it move is impressive to say the least. It really is a zoologist's dream come true - the ability to create whatever creature you want, to act like a digital God. There are limits of course, this is a computer simulation and not life, but the exponentially expanding Sporepedia of life shows just how incredibly flexible it can be. Naturally, my first inclination was to create a crocodile. Frankly, it turned out a bit flat because I hadn't figured out how to manipulate the body properly. I won't even assail your poor eyes with it! My second attempt, however, was much better. Of course, I took some liberties with the crocodilian form and ended up with something more akin to an endearingly cute crocodylomorph / dinosaur hybrid. There's a picture below, followed by the .png file so you can import it into the Creature Creator if you want to play around with it.